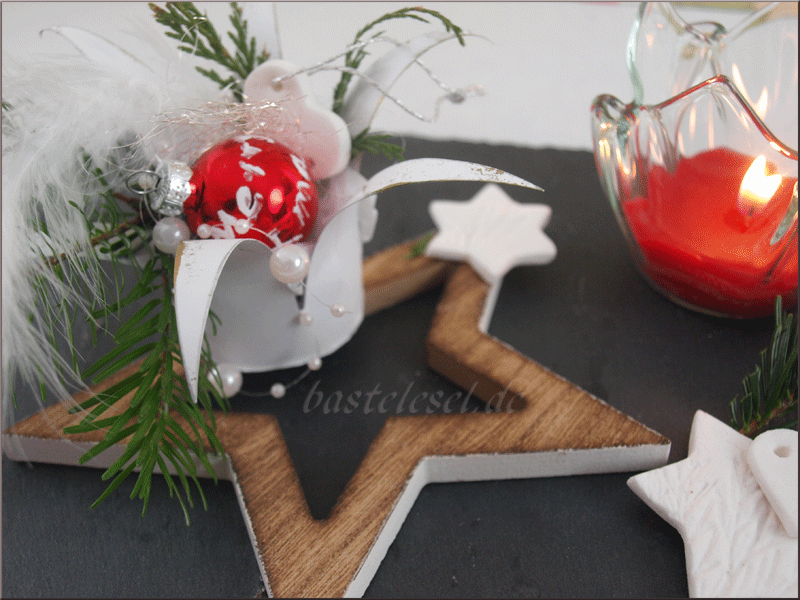 This little Christmas crown’s perfect as a little goodie for a Holiday invitation or as a place holder for your festive Christmas table. Fill it with everything you like for Christmas. 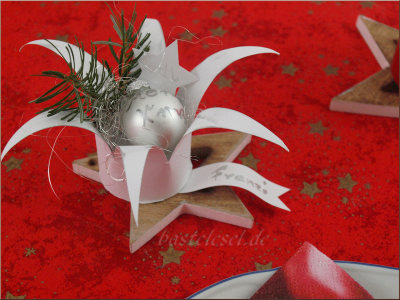 We took a small Christma ball, some angels hair, some fir twigs, pearls, a white feather and a small heart made of handmade porcelain. You’ll need a piece of card stock paper (120g) mesuring at least 20 x 15,5 cm. The free template shows exactly how to cut the six points of my crown. The 0.5cm stripe on the right side will be needed for closing it into a round. After glueing it the crown’s last tip needs to be recut. When dried put some further glue on the crown’s bottom and place it on your remaining piece of cardstock. Leave for drying and before starting to decorate your crown just cut away the outstanding cardstock. Then use the back of a knife or a folding tool to bow the crown’s tips. If you like it a bit glittery just shadow the edges with silver stamping color. If you like to use the crown as a place holder then just attach a little name tag outside or put it beside the Christmas ball. For a better stand I put my crwon on top of a wooden star matching with those holding my Christmas candles. My name tag’s just sitting under the crown so that I can easily take it away and use the crown elsewhere. You could as well use the little paper star inside the crown to write down the guest’s name. 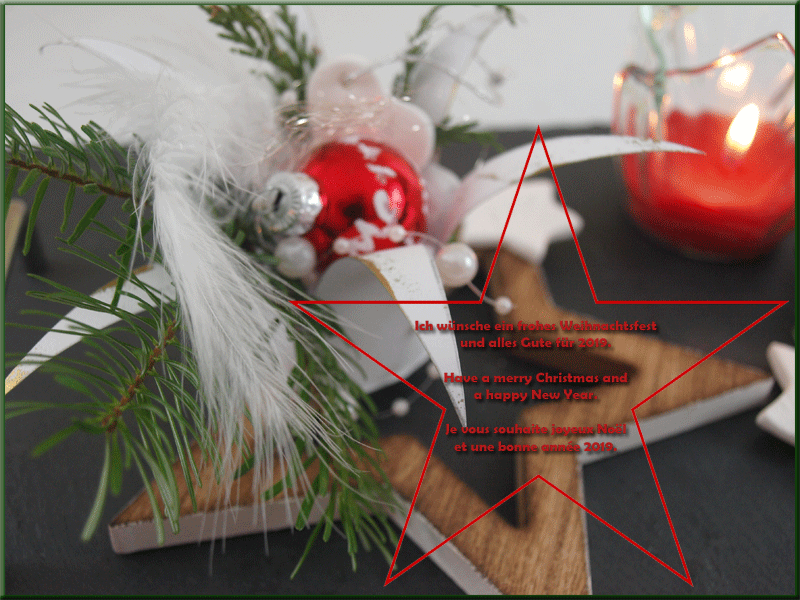 In case of using the crown as a little gift you should fix it with some glue to the wooden star. Here my crown’s sitting in a small wooden tray shaped as a star. I accompanied it with a tea light and some fir twigs. The edges of my porcelain star are also shadowed with stamping color. It’s a really nice set for your center piece. It could be realised in every differtent color. Every year again I really enjoy finding new kinds of lovely angels. This year I found one at the Christmas fair in Raesfeld . I took it home, opened it and made new ones myself. Inside the angel you’ll find a Rocher hazelnut chocolate but you may take any other chocolate with a diameter of maximum 3cm. Use it as a hostess gift or take it as a placeholder for your Christmas table. It’s most impressive if you use some lightly structured card stock. The template needs to be cut out twice. 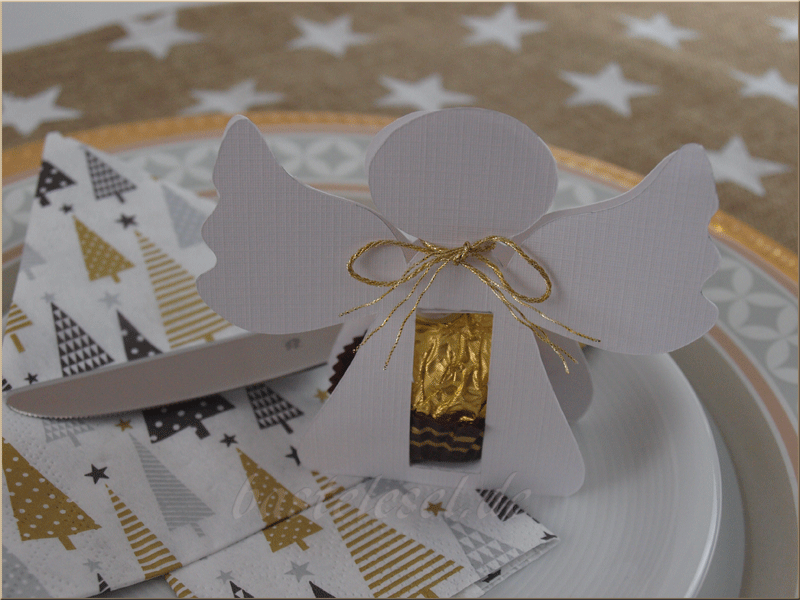 Then cut and fold every angel’s slot. Glue lower and upper paper bar on top of the other and when dried put the chocolate inside. 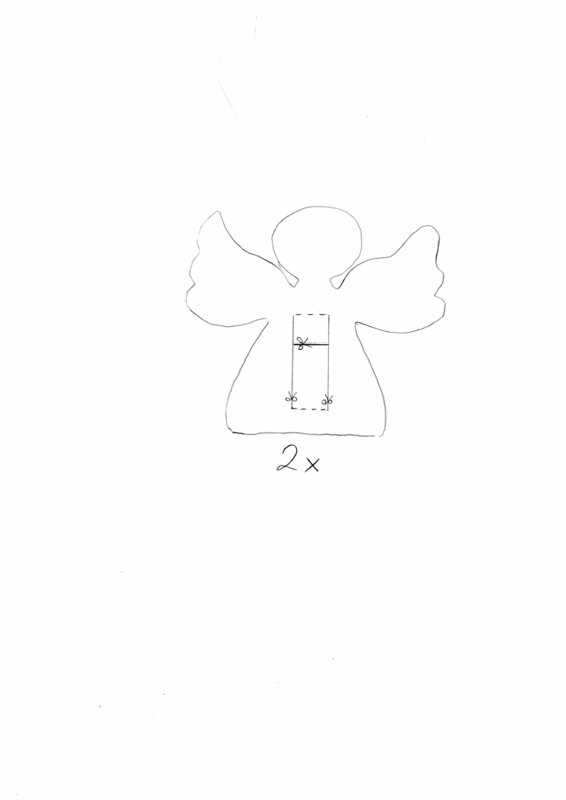 Then fix both heads with a tiny golden thread tied around the angel’s neck. If you want to use it as a place holder then write down the guest’s name on one of the wings or put a little name tag on top of the chocolate. 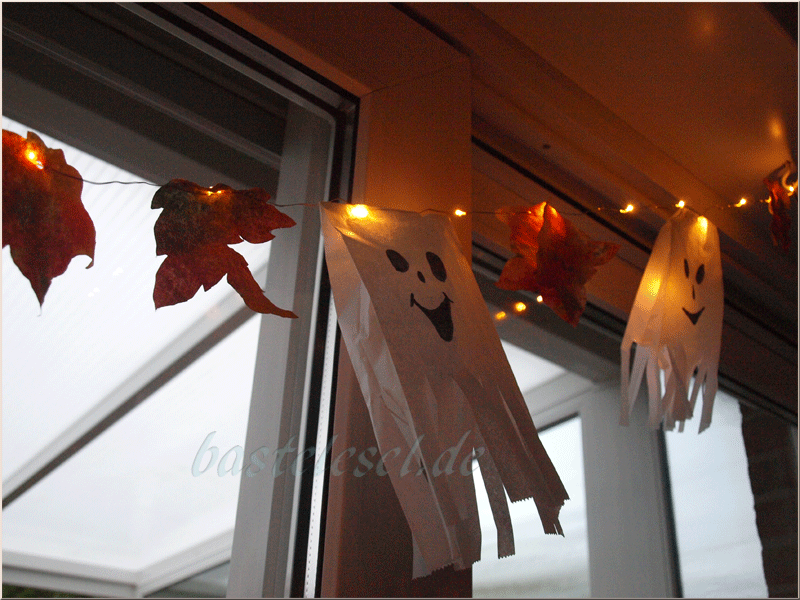 We’ll turn back time this weekend and soon later lots of little scary figures will ring the doorbell shouting: “Trick or treat?” Simply take some sandwich bags to have some ghosts on your window sill. Paint funny ghost faces with a black felt pen and cut the bag’s bottom into 1cm wide stripes. In order to fix them on a chain of lights cut small slit on both sides of the bag to pull the chain through the bag from one side to the other. Thus the bag’s bottom will hang over your chain. I placed some lovely colored leaves beside my ghosts. They weren’t found in our woods but in our kitchen. Their big advantage. 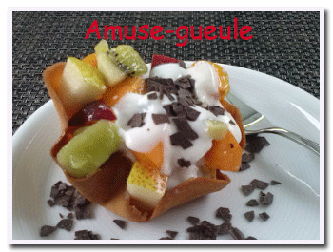 they won’t dry, won’t crumble lateron and even for kids it’s quite easy to make them. You’ll need filter paper and kids water colors. Use a plastic tray to work on. First lightly wet the paper with clean water, then take up the selected color with a soft paint brush and dab color on your filter paper. When dry, cut different leaves. In case of two-layered filter bags cut the leaves so that a small part of the bag’s bottom still sticks together. That allows you to simply hang them over one of the lights. Cut a small slit into single-layers filter paper and pull the chain through it alternating with the ghosts. While most of the summer flowers run out of steam our automn plants like dahlia, sunflower, Chinese lantern and hydrangea just start to be in top form. So why not take them in or put them on our patio table. When strolling through the local woods keep your eyes peeled for pieces of tree bark to take them home. If necessary ask the responsible ranger or landlord if you’re allowed to collect those pieces. Ours was a colleague’s gift. She had to fell a pine tree in her garden. It’s good to leave the bark in a dry place for some days thus enabling any tiny crawling animal to look for a new home. 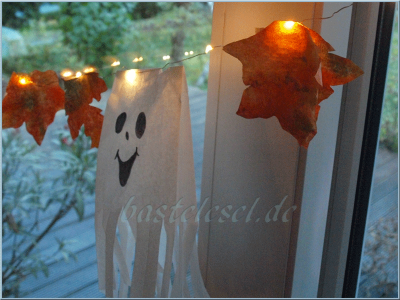 When dried start to decorate it with Chinese lanterns or other flowers from your garden or balcony. Most of the local florists are selling the little lanterns or maybe you’ll find a neighbour willing to share some of his plant with you. 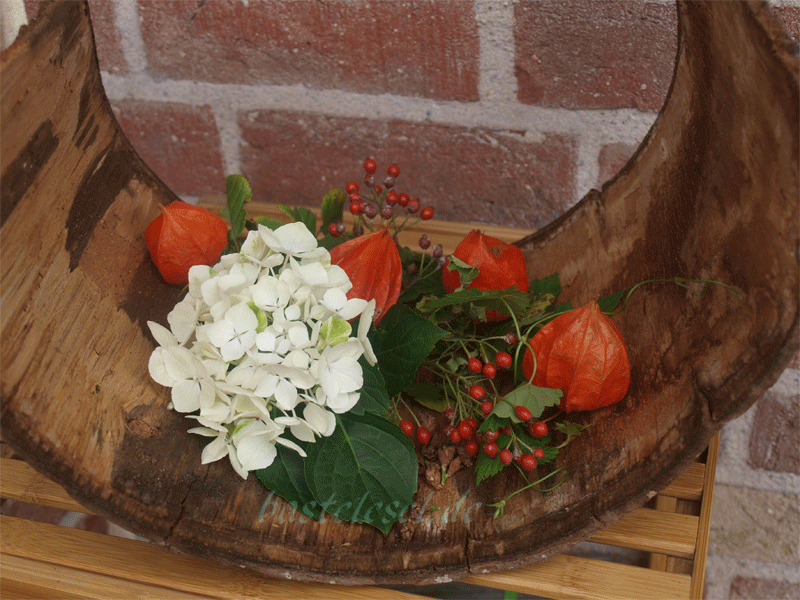 A large hydrangea flower will even allow you to use your bark as a center piece. As soon as the first leaves or flowers have faded replace by new ones. You may use chest or beechnut cupules, twigs of yew tree or cypress and even hop tendrils are looking very nice. For Holiday season choose pine cones twigs, wooden stars or a pine cone goblin and here you are with a wonderful Christmas decoration. 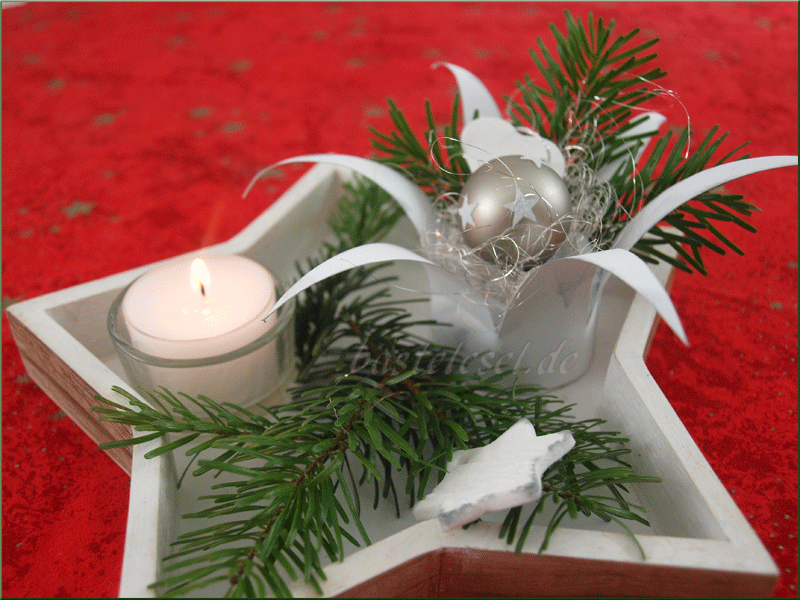 For Christmas Eve you may even create a highlight with a wooden angel, some tinsel tressels and small Christmas balls.